Looking to escape the grind? Give the Royal Conservatoire of Scotland a shot (or two) as it prepares to offer the perfect blend of music and coffee with a fabulous hour of classical music performed by some of the best emerging and professional musicians in Scotland. The Hilary Rosin Coffee Concert series welcomes leading performers as they join forces with Royal Conservatoire students and alumni to entertain audience members in a relaxed setting for the hour-long, Sunday morning performances. An impressive line-up will take to the stage including Royal Conservatoire alumna and BBC Cardiff Singer of the World finalist, Anush Hovhannisyan. Fellow graduate, baritone and Scottish Opera Emerging Artist Alexey Gusev, will perform, accompanied by Timothy Dean. Other artists include violinist Andrea Gajic, Associate Leader of the BBC Scottish Symphony Orchestra, Kanako Ito, and the orchestra’s Section Principal Cello, Martin Storey. Audience members can mingle with performers over free coffee and a sweet treat after the concerts in Scotland’s national conservatoire, ranked in the world’s top three for performing arts education and number one in Scotland for graduate employability. 22 October: An exciting exploration of one of the major composers of the 20th century, Prokofiev, including his Sonata for Violin and Piano No 1 in f minor, Op 80, performed by Andrea Gajic (violin) and Sinae Lee (piano). 29 October: A concert dedicated to the works of Mendelssohn, one of the most popular composers of the Romantic era. The programme includes Mendelssohn’s Piano Trio No 2 in c minor, Op 66, featuring Kanako Ito (violin), Martin Storey (cello) and Fali Pavri (piano). 5 November: Recent graduate, Russian baritone Alexey Gusev will be accompanied by Timothy Dean to perform a selection of Russian songs by Rachmaninoff, Dargomijsky, Alyabyev and Varlamov. 12 November: To conclude the Hilary Rosin Coffee Concert series, we have a special concert including graduate Anush Hovhannisyan, accompanied by Timothy Dean. Repertoire from Rimsky-Korsakov includes The Clouds Begin to Scatter, The Lark Sings Louder, Not the Wind and Summer Night’s Dream. The concert series celebrates the life of Hilary Rosin, a piano teacher in Glasgow’s south side who encouraged generations of pupils to make music an active and enriching part of their everyday lives. 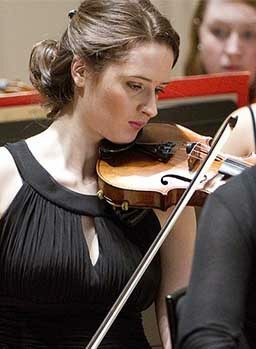 Professor Jeffrey Sharkey, Principal of the Royal Conservatoire, said: “Hilary Rosin made an indelible contribution to Glasgow’s music and cultural life. Hilary Rosin Coffee Concerts take place on Sunday mornings at 11.30am from 22 October until 12 November. Anyone aged 26 or under will be able to enjoy any seat in the house for £5 by signing up to the Royal Conservatoire’s Ticket26 initiative. Visit rcs.ac.uk/ticket26 for more information.